French are not the only ones to eat snails, Spanish are also fond of it! This recipe of snails come straight from Catalonia! It was during our stay at Gilma, Gualberto and Joan house in the town of Oropesa del Mar that we could enjoy the “Caracoles en Catalan”, a true delight! Unfortunately we could not observe the preparation, but we asked for the recipe. Translated from Spanish it may lack of details, so we invite you to try it and share your way of preparation! 1) If you buy snails having fasted and already cleaned you can skip to step 2. Otherwise leave the snails fast for 2 weeks. Then rinse them in salted water until there is no more mud. 2) Remove the film that closes the snails with a knife and plunge them into cold water. Heat the mixture on a low heat and boil for 15 minutes. Then remove from water and drain. 3) In a pan, put a little of olive oil and fry chorizo​​, onion, garlic, ham and chili. Add the tomato pulp and cook it for 5 minutes. Add snails, stir and continue cooking for 10 more minutes. And now it’s ready! 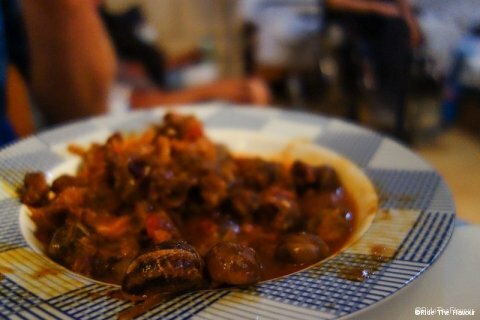 We hope you have as much pleasure as we had eating these Catalan snails!